Most of the Bengali groups are easily defined by their common language, Bengali. However, there are several smaller tribes who are also referred to as Bengali, but speak languages other than Bengali. Their languages belong to the Assamese-Bengali sub-group of the Indo-Aryan language family and include these groups: the Hajong and Kishanganjia of India; the Hajong and Tajpuri of Bangladesh; and the Rajbansi and Kayort of Nepal. The Hajong originated in the Chittagong Hill Tracts of Bangladesh, then migrated north. Today, most of them live in east central Bangladesh, primarily in the northern part of the Mymensingh district, which lies on the southern slopes of the Garo Hills. From there, some immigrated into India and now live in the states of Assam, West Bengal, and Arunachal Pradesh. Unfortunately, many of those who now live in Arunachal Pradesh are under consideration of eviction, even though they have been settled there for 30 years. The Tajpuri live in the plains of Rangpur, which is located in northern Bangladesh near the border of India. The great majority of the Bengali who live in India and Bangladesh are involved in some type of farming. Wet rice is their primary crop, and wheat and potatoes have also recently been added. Some have remarkable skills in weaving and embroidery. They make items that can be traded in the weekly markets. The various Bengali tribes, like most other people groups of South Asia, have a clear division of labor. Regardless of a family's occupational specialty, the men do jobs that take place outside of the home, while the women are responsible for the tasks that can be performed inside the home. Among these tribes, land has always been individually owned. Small family farms, which are usually about one hectare in size (about 2.5 acres), are often sub-divided. Most marriages in Bengali society are arranged. However, there are marked differences between the Hindu and Muslim wedding ceremonies. When mates are being chosen, caste and social rank are very important considerations. In rural areas, married couples almost always live with or near the groom's parents. The only exception to this practice is among the Tajpuri; and even they are gradually conforming. Most of the tribal Bengali communities have special dormitories where single young men live. This "house" is also used as a meeting place for the village elders. The racial origin of one Bengali tribe, the Tajpuri, is surrounded by much controversy. Although they claim to be the descendants of great kings, they belong to a matriarchal (female-dominated) society. In general, the various Bengali tribes are "Hinduized" religionists. Although they have adopted the Hindu caste system and the worship of millions of Hindu gods, they also continue to practice their ethnic religions. 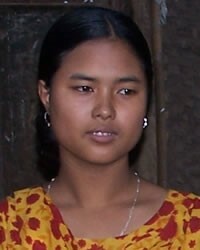 Only one Bengali tribe, the Tajpuri of Bangladesh, has a considerable number of Muslims (almost one-third). Nevertheless, they too, practice some of their ethnic beliefs alongside Islam. Like other tribal groups, the Bengali are animists, believing that the spirits of the gods live inside the mountains, the rivers, and the forests. Therefore, many objects in nature are worshipped. However, as they are becoming more and more educated, many are coming out of their world of animism and magic. * Pray that Christian radio broadcasts, Bibles, and other literature will be made available to each of the Tribal Bengali groups. * Ask the Lord to raise up strong local churches among the Tribal Bengali. View Hajang in all countries.